If you're interested in the saddest father-son automaker story since Edsel Ford handed the family business over to Henry Ford II, dooming William Clay Ford to forever own the worst football team in existence, you may want to turn on BBC America at 7:00 PM EST. More details below. In the ongoing struggle over the auto industry bailout there has been endless debate on Capitol Hill and around the country. 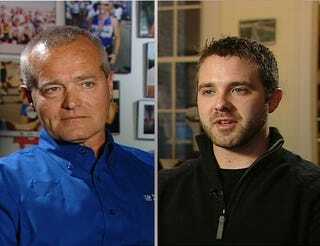 But for the Brewer family it has become a personal affair - pitting father against son. For more than three decades Tom Brewer has worked for General Motors and is currently at one of their plants in Tennessee. His son Jake is the Internet Director for the Green Energy Coalition and on his blog he expressed his reservations about the bailout in an open letter to his father. BBC World News America presents a first person account in which Jake and Tom share their views on this issue which has sparked a family feud.